Although the country of Togo is small, there is no lack of diversity amongst its traditional dance forms. 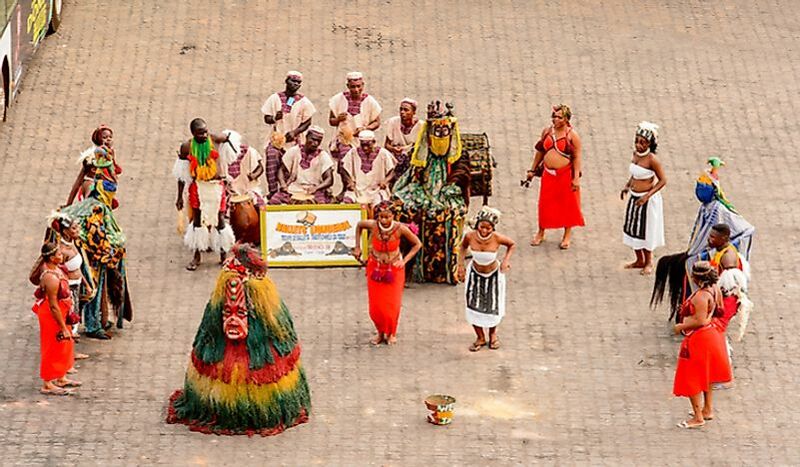 Togolese people perform a dance in traditional costumes in Lomé, Togo. Editorial credit: Anton_Ivanov / Shutterstock.com. Togo, a small French-speaking nation in West Africa, is a rewarding destination for those fond of exploring the unknown. The nation is wedged between Ghana to the west and Benin to the east. North-to-south, it extends between Burkina Faso and the Gulf of Guinea. Despite its small size of just 57,000 square kilometers, Togo has a great diversity of landscapes and cultures. The country is home to about 40 different ethnic groups. The people of Togo take great pride in their culture and have managed to protect and preserve the same over the centuries. Today, the modern-day Togolese are making diligent efforts to promote their culture worldwide. Cultural groups like the Akinatim Folk Dance and Music Band are making sure that the global community gets the opportunity of knowing and experiencing the rich culture of the country. In this article, we explore the rich dance and music scene of Togo with the help of the members of the Akinatim Folk Dance and Music Band. Compared to most other nations on the continent, the history of Togo is short. It can be regarded as a land of migrants. Between the 11th and the 16th centuries, many tribes started entering the region from all directions. These tribes brought their distinct cultures with them. Later, Togo came under European colonial rule and became a hub of the slave trade that supplied enslaved Africans to European plantations. However, despite the European influence on Togo’s culture, the people here never gave up their traditional beliefs and practices. This fact is evident today as much of Togo still remain steeped in such beliefs including an adherence to voodoo practices. The youth of the country has also not forgotten their traditional dance and music forms and are more than eager to showcase their rich cultural heritage on the global stage. To learn more about the aspirations of Togo’s culture conscious youth, World Atlas caught up with Houngbo Apélété (Gaéthan), the President and lead choreographer of the Akinatim Folk Dance and Music Band (“Akinatim means “face of love”) based in Togo. This music and folk dance group was established in 2010 by some young men and women from Lome (Togo’s capital city) under the impetus of Houngbo Apélété (Gaéthan). The group was recognized by the Ministry in charge of the Territorial Administration, Decentralization, and Local Authorities of Togo in 2013, and also introduced in the official journal of the Togolese Republic. “Our primary vision in establishing the Akinatim Folk Dance and Music Band was to work for the promotion of artists, art and culture of Togo in the context of globalization,” Houngbo Apélété informed World Atlas. It was his keen wish to promote Togolese culture that led him to explore the different types of indigenous dance forms of the country. He provided us with a generous list of some of these dance forms. Dances from southern Togo: Adifo, Aguiche, Djêkê, Gbékon, Sakpata, Agbadja, Atchanhoun, Akpêssê and Kinkan, Tchébé, Tchonhouin, Tchobo, Almon, akpoka or Atrikpui, Dan, Guèlèlè, and Blékété. Further, he also believes that it is not just the music and dance performances that portray the culture of a community. The dresses used in the dance performances are also equally important as they are usually unique to a particular culture. Unlike the young urban youth in many other parts of the world, the youth of Togo are not ready to part with their rich culture and heritage. On the contrary, they are now stepping out of their country to showcase their culture to the world. The Akinatim Folk Dance and Music Band have already participated in several international dance festivals like the 2014 Dubai Shopping Festival, the 2015 IGF Folklore Festival in France, and the 2017 Katara Diversity Cultural Festival. Here, the group has proudly showcased their country’s culture and earned accolades from the international community for their excellent performances. Today, the work of the members of the Akinatim Folk Dance and Music Band serve as an inspiration to the youth of many other cultures across Africa who have left their culture and heritage behind to lead a "modern urban lifestyle" heavily influenced by the Western culture. It is important for them to realize that it is possible to lead a "modern" lifestyle while at the same time, protect and preserve their identity, and the rich culture of their community, as that is what makes them truly unique.